CAMP MCTUREOUS, Okinawa, Japan — For a child, life in the land of the rising sun may be a difficult transition to make. The absence of the red, white and blue homeland can be hard on some of the military dependent children who are used to the customs and traditions of the U.S. However, as the students of Bechtel Elementary School are finding out, the Okinawan culture is an alluring society full of interesting art and playful creatures. 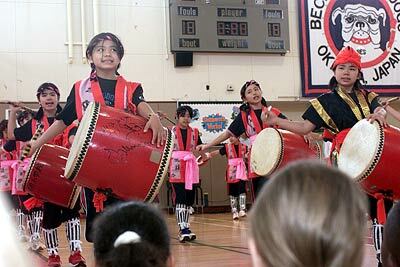 Bechtel hosted its 11th Annual Ryukyu Festival in the school’s gymnasium April 29. The festival is a way to introduce the students to the culture and traditions of Okinawa, according to Barbara Lambert, Ryukyu Festival chairperson. Bechtel students were treated to taiko drum performances from the Mihoso and Kadena Kokusai Matsuri Taiko Drummers, a lion dance from the Tengan Himawari Kodomokai dancers, and a sumo wrestling demonstration from Chubu Norin High School. For the past eleven years, Bechtel has been bringing together American and Okinawan communities through the actions of the Ryukyu Festival. Lambert said it is important to bring Okinawans and American military dependents together. The smiles grew on the faces of the students with every bang of the taiko drum, snap of the lion dancers jaw or slam of a sumo wrestler on a mat. Peeples said he enjoyed the show so much that he would like to do more than just watch the performers. The entertainers put on five separate performers for the students, but the staff and faculty at Bechtel played a big part in the success of the event Lambert said. 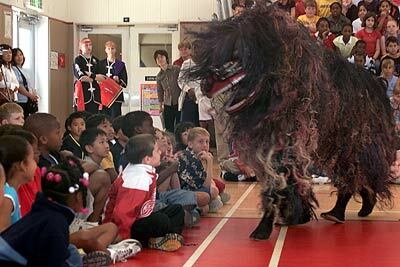 The Ryukyu Festival has been a part of Bechtel’s curriculum since 1990. Since its beginning, the students have and will continue to learn more about the Okinawan culture, according to Lambert.